Here we define the equations and parameters that describe the novel genetic toggle switch that works at the translational level. The switch allows mutually exclusive expression of either green fluorescent protein (GFP) or cyan fluorescent protein (CFP). The synthetic biological circuit is represented in Fig 1. Figure 1: Translation of DNA to mRNA. We can regulate the system when we add galactose or methionine. Galactose will bind to the GAL promoter and activate the transcription of M1, allowing the system to express GFP. 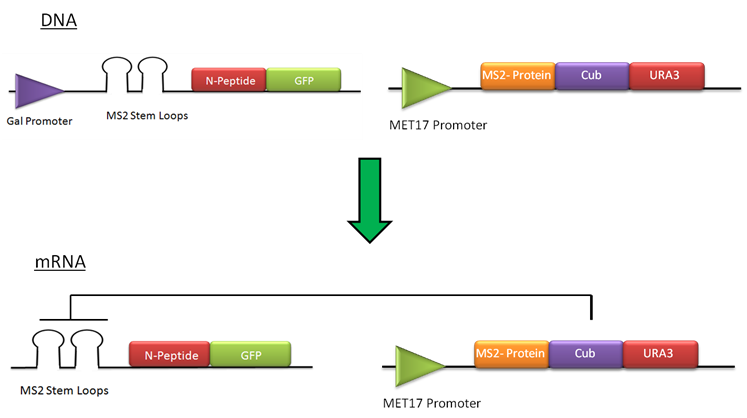 If we remove methionine from the system instead of adding galactose, it will bind to the MET1 promoter, the transcription of M2 will be activated, leading to the expression of CFP. From Fig 1 it can be seen that there is mutual inhibition of the translation of the two mRNAs. That is because the translated proteins can bind to the corresponding stem loop structures on the opposing construct. For our initial conditions, we began with more GFP than CFP and thus the production of CFP was inhibited. When methionine was added removed from the system, the rate of CFP production will increase and decrease for GFP. Eventually, we will see more CFP than GFP so the system will have switched. Once we have more CFP than GFP, galactose can then be added to switch back to an expression of GFP. The N-Peptide and GFP strand has two MS2-Stem loops as we discovered that one single loop would not inhibit the production of CFP enough to achieve our switch. This is the equation for the rate of change of the mRNA that is transcribed from the galactose promoter. The three terms represent production, degradation, and dilution respectively. [GAL] represents the concentration of galactose that is added to the system. When galactose is added it binds to the promoter and activates the transcription of M1. [M1] is the concentration of mRNA that translates the N-peptide and GFP. This is the equation for the rate of change of protein that is translated from the mRNA for GFP. The three terms represent production, degradation, and dilution respectively. [M1] is the concentration of mRNA that translates the N-peptide GFP. [GFP] represents the concentration of N-peptide and GFP. [CFP] represents the concentration of the MS2-protein and CFP. This is the equation for the rate of change of the mRNA that is transcribed from the copper promoter. The three terms represent production, degradation, and dilution respectively. 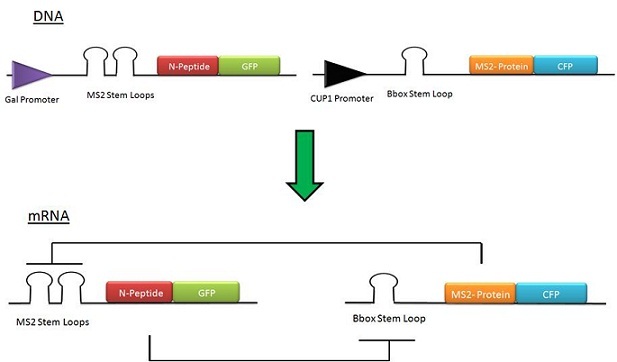 [Cu2+] is the concentration of the copper added to the system that binds to the CUP1 promoter and activates the transcription of M2. [M2] represents the concentration of mRNA that translates the MS2-protein and CFP. This is the equation for the rate of change of protein that is translated from the mRNA for CFP. The three terms represent production, degradation, and dilution respectively. [M2] is the concentration of mRNA that translates to MS2-protein and CFP. [GFP] represents the concentration of the N-peptide and GFP. The parameter values were first estimated based on the literature  and after the first estimation, a possible range of variation for each parameter was assigned, also based on literature. Then, we studied the bistability of the model depending on the parameter values that were varied in the above mentioned ranges. For more information, see Parameter Space Analysis and Directed Evolution. Beyer A, Hollunder J, Nasheuer HP, Wilhelm T. (2004), Post-transcriptional expression regulation in the yeast Saccharomyces cerevisiae on a genomic scale, Mol Cell Proteomics., Vol. 3, No.11, pp. 1083-1092. Alon, U. (2006), An Introduction to Systems Biology: Design Principles of Biological Circuits, Chapman and Hall.